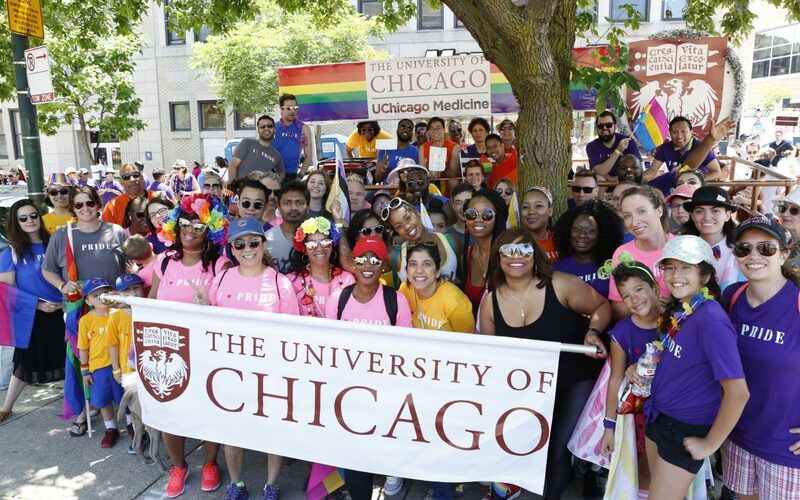 Coordinated by the Biological Sciences Division’s Office of Diversity and Inclusion and LGBTQ+ resource group, more than 75 faculty, staff, students and allies proudly participated in the parade – from excitedly waving and dancing on the float to joyously distributing UChicago branded water bottles to onlookers along the parade route. It is estimated that more than 1 million people descended upon Chicago’s Lakeview neighborhood to be a part of the merriment that takes place once a year on the last Sunday in the month of June. Orlando “El Fenomeno” Cruz, the first openly gay active professional boxer, served as the parade’s grand marshal and led more than 150 entries of floats, bands, performers and community-based organizations down the parade route. UChicago Medicine and the Biological Sciences Division have a longstanding commitment to value and honor the diversity of its students, faculty, staff and patients. It’s continued recognition as a “Leader in LGBTQ Healthcare Equality” by the Human Rights Campaign demonstrates an ongoing commitment to ensuring that the organization welcomes diversity and understands its benefits in providing quality care for patients and a safe and inclusive work environment for employees.